P.S.- Just ignore the smell. yes, well hanging workers wouldnt add much to the decor now would it? So that's why the hotel had the top suicide rate. people hanging outside my window? aah that's not so bad! 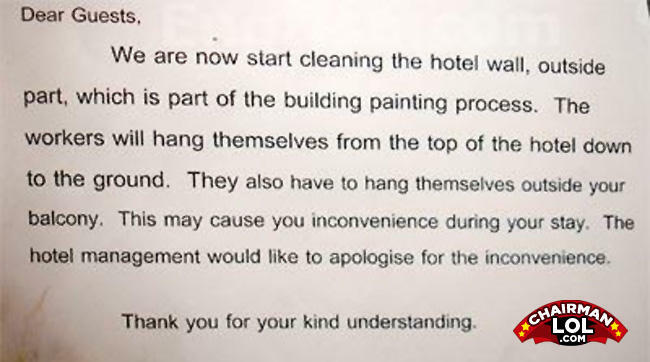 Ok so workers will hang themselves left right and center during your stay, but hey! at least they apologize! That's one way to hang around. If their hanging themselves from the top to the down to the ground, why not stay at the ground?! The workers really hate their job. What do you get when you cross a pelican with a mountain goat?